People examining the full line of Lie-Nielsen tools. 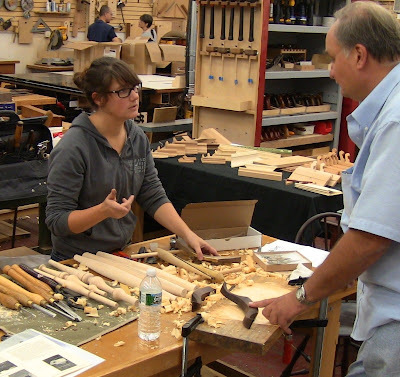 Last Friday and Saturday I participated in the Lie-Nielsen Hand Tool Event at the Connecticut Valley School of Woodworking, representing the Society of American Period Furniture Makers. These events are a chance for people to see the full line of Lie-Nielsen tools, try them out, and talk to LN staff about how to use them. CVSW is a fantastic venue. It's huge, located in a warehouse-sized space behind the Manchester, CT, Woodcraft store. 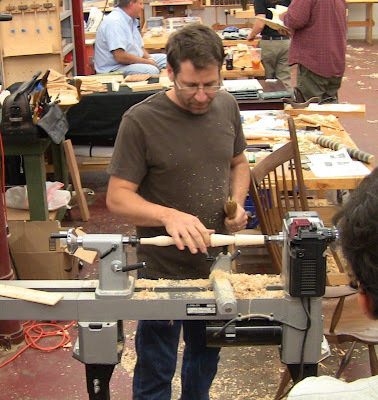 Founder and director Bob Van Dyke teaches and hosts a number of different instructors for classes at all skill levels, using both power and hand tools. This is where SAPFM New England Chapter Coordinator Freddy Roman got his start. 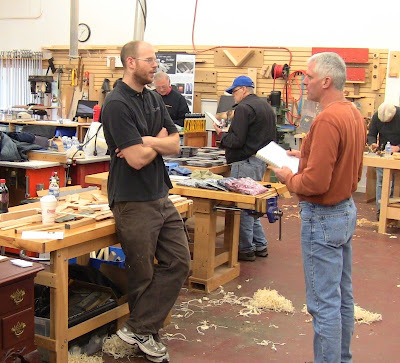 Guest instructors on the schedule for the next year include well-known names like former Popular Woodworking Magazine editor Chris Schwarz, furniture-makers Steve Latta and Will Neptune, carver Mary May, chairmaker Peter Galbert, SAPFM co-founder Mickey Callahan, Fine Woodworking Art Director Mike Pekovich, and 17th-century furniture-maker Peter Follansbee, as well as up-and-coming people like planemaker Matt Bickford and handsaw expert Matt Cianci. The range of skills, techniques, and styles offers tremendous opportunity for students. Bob also keeps great music going in the background. I told him it had been years since I heard Robin Trower! Bob Van Dyke working on sand-shaded fan inlay for a Federal-style table. 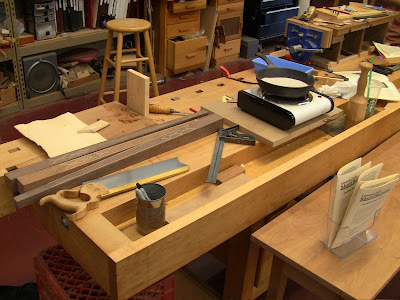 Bob's workbench with Federal-style legs with inlaid stringing, pan of sand on hot-plate for sand-shading, and raised mini-bench at upper right. 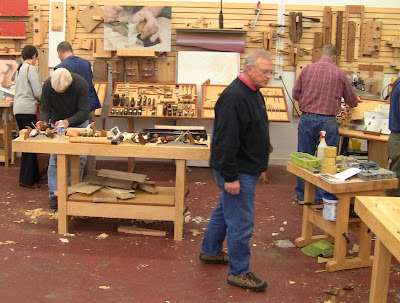 One of the really nice things that Lie-Nielsen does at these events is bring in a number of people who are hand tool woodworkers or have their own small businesses making hand tools and related items. Freddy Roman worked on inlaying a set of walnut table legs. Peter Follansbee worked on building a joined stool from freshly riven oak, like the one in the new book he co-authored with Jennie Alexander, Make a Joint Stool From a Tree. Tico Vogt of Vogt Toolworks demonstrated his Super Chute 2.0 shooting board. Matt Bickford demonstrated the magnificent wooden moulding planes he makes. I had him autograph my copy of his new book Mouldings in Practice. Joshua Clark of Hyperkitten Tools had antique tools for sale. Matt Cianci had handsaws for sale. Peter Galbert and North Bennet St. School graduate Claire Minihan demonstrated chair-making techniques. He was taking orders for his travishers and had several for people to try. Claire works for Peter making them; these were amazing, excavating a pine chair seat so fast there's hardly need for an adze or in-shave. Shavings just shoot out the back as you work. 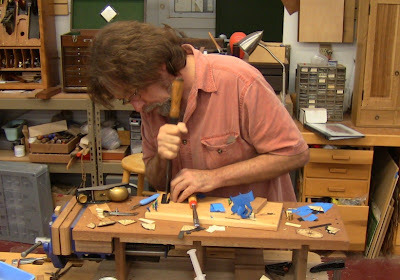 Peter's blog is full of information and great videos that helped me with my turning skills. In fact, I just now had a "Holy crap!" moment watching this one; I had to run downstairs to the workshop for a few minutes to try out my wooden spokeshaves that I've been struggling with. Thanks, Peter! 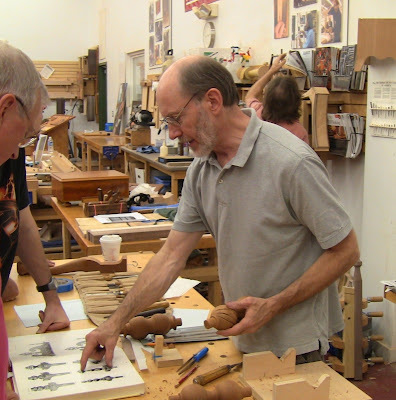 Will Neptune came on Saturday, demonstrating carving on turnings. Hot off the press: Will Neptune was just announced as the SAPFM 2013 Cartouche Award Winner. Congratulations, Will! Peter Galbert also deserves a special mention because he's featured in Jonathan Binzen's monthly profile on the back of the current issue of Fine Woodworking ("Tools and Shops Annual Issue", Winter 2012/13 No. 230). There's an accompanying audio slideshow in FW's extras. Congratulations, Peter! Peter Follansbee and Matt Cianci were only there Friday, but I forgot to get pictures that day. Peter wasn't on the list of demonstrators at the LN website, so I didn't bring my copy of his book for him to autograph. Next time! I spent the two days telling people about SAPFM and demonstrating techniques like sharpening, dovetailing, and using planes and spokeshaves. As always, my LN Brian Boggs spokeshave is a great tool to engage people and have them try. It's just a joy to use. I had my portable sharpening station with me, which a number of people liked. I also started work on the door for a small cherry hanging cabinet, so I demonstrated how to raise the panel with #5 plane with cambered iron, #10 rabbet plane, and shoulder plane. The door will be like the one I made this summer in the class I took at LN with Roy Underhill. This is a great demonstration project because it's small and portable, yet encompasses a lot of different skills, from raw stock preparation to mortise and tenon and dovetail joints along with the panel-raising. A couple of people who I've given private home classes to came by to say hi, Larry Ciccolo and Rick Roberts, as did hand plane doctor Bill Rittner, whom I had met at Rick's. Late Saturday Rob Porcaro of the Heartwood blog introduced himself and had some very nice things to say about my blog. He asked if I ever sleep! Yes, occasionally. Freddy Roman unwrapping some of the inlay pieces he's using to decorate a set of table legs. Will Neptune, Freddy's shop partner, demonstrating carving on turnings. Matt Bickford talking about moulding planes. Peter Galbert turning chair parts. 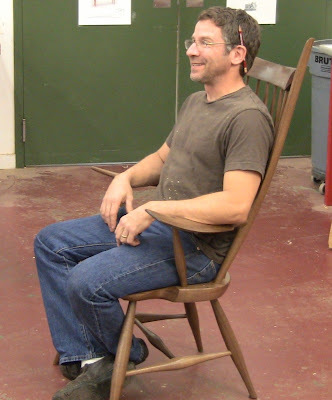 Peter with his beautiful and amazingly comfortable Windsor chair made out of walnut. Claire Minihan makes Peter's travishers. These things are a dream to use. Tico Vogt talking about his Super Chute 2.0 shooting board. 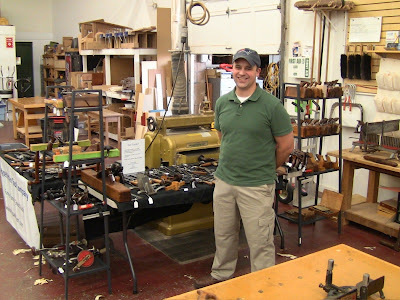 Joshua Clark with his array of antique hand tools for sale. 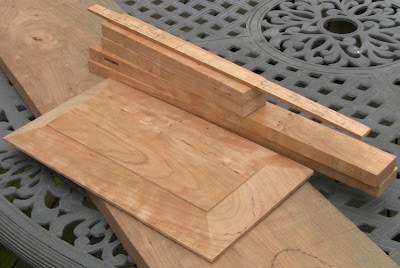 The progress I made on the cherry cabinet door, starting from the rough board on the bottom. The piece of scrap on top is my story stick, where I laid out all the door joinery. I got a fair amount of work done on my cabinet project in between talking and demonstrating other things. I dimensioned the door parts from rough board, raised the panel, and completed one stile mortise. I worked up a sweat planing, but I just love working with cherry. It's gorgeous with the grain flashing in the light, leaving a magnificent surface from the plane, and shapes with incredibly crisp edges. I'd like to thank Deneb Puchalski of Lie-Nielsen and Bob Van Dyke for letting me participate. November 30 and December 1, I'll be representing SAPFM again at the LN Hand Tool Event at the Furniture Institute of Massachusetts. If you get a chance, come out, say hi, and try out some of the finest hand tools on the planet. Looks like an interesting event is it annual? 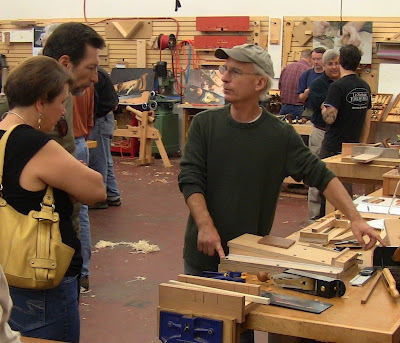 Yes, part of LN's annual series of Hand Tool Events around the country. Today and tomorrow I'm at the Hand Tool Event at Furniture Institute of Massachusetts in Beverly, MA, another annual location.